Today’s announcement follows demonstrations of IAI’s semi-robotic pilot controlled vehicle ‘TaxiBot’ to leading airlines in Chateauroux Airport, France. Senior representatives and test pilots of various leading airlines and ground handling companies including Lufthansa, KLM, British Airways, CEA (China Eastern Airlines), CSA (China South Airlines), Federal Express, Air France, United Airways, WestJet, Aéroport de Paris and Swissport, evaluated the TaxiBot towing system. Pilots were able to conduct, from the cockpit of an Airbus A320, a series of driving and control tests of the vehicle as part of the advanced evaluation process which various airlines are taking with respect to possible operational use of the TaxiBot system in airports around the world. The new version of TaxiBot will be specifically targeted at applications involving wide body aircraft, where the potential for emissions reductions and fuel savings are even greater than the currently developed narrow bodied jet system. Ricardo’s involvement in the development of IAI’s TaxiBot concept dates from the very start of the engineering programme for the first demonstration vehicle in 2008. After an initial feasibility study, Ricardo developed a detailed programme for IAI to take the concept to the level of a working demonstrator vehicle with representative capability in order to prove the concept. Ricardo’s involvement in this work included initial requirements capture, conceptual design and modelling, followed by detailed specification design and the company’s engineers subsequently went on to support IAI with the manufacture and demonstration of the first TaxiBot demonstrator vehicle. 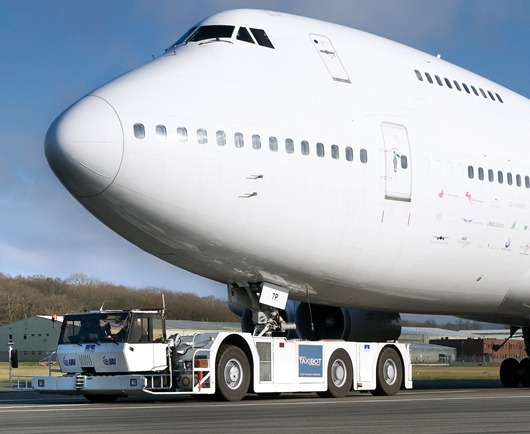 According to IAI the overall worldwide cost of aircraft taxiing is estimated to exceed $8.5 billion per year by 2020; TaxiBot based taxiing has the potential to reduce this to less than $3 billion per year with consequent reductions in carbon dioxide emissions and reduced noise in the vicinity of airport ground operations.